This section will take you step-by-step through a sample log-on session. Modem I will be used to log-on to CompuServe. See your CompuServe Information Service User’s Guide for details. Make sure the modem and cassette recorder are connected to the MC-10. Turn the Television’s power ON. Turn the MC-10's power ON. 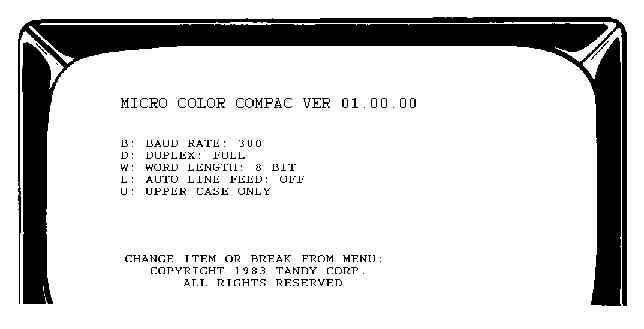 Insert the Micro Color Compac program tape (supplied with this package) into the cassette recorder. Be sure the tape is completely rewound. The MC-10 will search for and load the program. While it is “searching” for the program, the letter S will appear in the upper-left corner of the TV Screen. When the program has been found, the letter F and the filename will appear at the top of the Screen. If you did not specify the filename, the first program encountered was loaded into the Computer. These are the communications parameters you will need to communicate with CompuServe. When CompuServe answers, you'll hear a high-pitched sound. Set the modem's switch to ORG (for "originate"). Hang up the phone. Note: Some host computers may require a control code at this time, or a terminal identifier or both. This message will be displayed. will then appear on the Computer display. Type in your password. For example: AGENT007 [ENTER]. Notice that the password was not displayed. Once the correct password has been entered, you will be on-line with CompuServe. The telephone connection is broken.